At the Sacrament of Baptism we wear special gowns, the Sacrament of First Communion we wear white dresses or suit, at our Marriage we wear formal gowns or tuxedos. 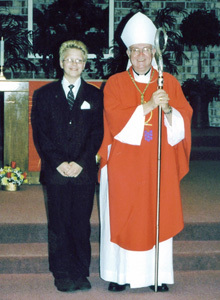 It is fitting to dress in celebration of the Sacrament of Confirmation as well. It is in this spirit of fostering respect for each other and for sanctity of the Sacrament of Confirmation that we set forth a code of dress consistent with our culture’s view of modesty. Semi-formal, modest attire is appropriate to the solemn beauty of this occasion. St. Peter’s Basilica in Vatican City maintains a strict dress code. Even in the summer, shoulders must be covered at all times, shorts, short dresses, tank tops, and any revealing clothing are not permitted inside.